Download "Calendar 2014-15 DEGREES, DIPLOMAS AND CERTIFICATES AWARDED IN CONJUNCTION WITH THE GLASGOW SCHOOL OF ART"
4 GSA.4 Introduction APPEALS BY STUDENTS The Code of Appeals for students pursuing programmes which are taught either wholly or partly in The Glasgow School of Art, and which lead to the award of degrees and diplomas of the University of Glasgow, is set out at the end of this section of the University Calendar. The validity of this procedure has been accepted by the Senate of the University and the Academic Council of the School. Appeals will not be entertained against marks or decisions of examiners, or other matters of academic judgement, but only on grounds of unfair procedure or medical evidence. INTRODUCTION The University of Glasgow awards degrees to students who have undertaken degree programmes in several Higher Education Institutions associated with the University. Most classes are taken in the Institution where the student is based, but where appropriate examining and some teaching is by staff of the Institution and the University. It shall be competent for the University Court, on the recommendation of the Senate, to recognise as teachers of the University such lecturers and other officers of The Glasgow School of Art as having responsibility for programmes qualifying for all degrees. THE STUDY OF ARCHITECTURE The Degree of Bachelor of Architecture (BArch), taught in the Mackintosh School of Architecture in The Glasgow School of Art, is awarded as an Ordinary (three years full-time or four years part-time), or Honours (four years full-time or four years part-time with one year full-time) Degree. The Diploma in Architecture is awarded after successful completion of two years of full-time study, or three years of parttime study. A student who achieves a distinction at the Diploma in Architecture examination will be offered the opportunity to convert the Diploma to a Master of Architecture (by Conversion) Degree, by undertaking a further period of one postgraduate stage of full-time study or two sessions of part-time study. The Mackintosh School of Architecture provides the teaching required to Part 2 level for registration as an architect in the U.K., recognised by the Architects Registration Board (ARB) and by the Royal Institute of British Architects (RIBA). Full registration (i.e. to Part 3 level) involves study over seven years, as follows: three years full-time or four years part-time (ARB/RIBA Part 1); Practical experience, one year (full-time only); two years full-time or three years part-time (ARB/RIBA Part 2); Practical experience, one year, followed by Professional Practice Examination (RIBA Part 3), taken externally. THE STUDY OF BACHELOR OF ARTS (BA) AND BACHELOR OF DESIGN (BDes) The Degrees of Bachelor of Arts (BA) and Bachelor of Design (BDes) are offered as four-year Honours Degrees taught at The Glasgow School of Art. THE STUDY OF PRODUCT DESIGN The Degree of Bachelor of Design BDes (Product Design) is offered as a four year Honours Degree taught by The Glasgow School of Art. A five-year programme leading to the award of the Degree of Master of European Design MEDes (Product Design) is also available. THE STUDY OF PRODUCT DESIGN ENGINEERING The University of Glasgow and The Glasgow School of Art jointly run and teach the Product Design Engineering programme. They offer Honours Degrees in Product Design Engineering as a four-year Bachelor of Engineering and a five year Master of Engineering, the latter also offered as a four-year accelerated route to suitably qualified students. The Masters programme is designed to meet the educational requirements for registration as a Chartered Engineer. The merging of two distinguished and distinctive educational cultures ensures that graduates receive the appropriate breadth and depth of education in engineering and design to be able to provide innovative solutions to the many challenges inherent in new product design and development. Details may be obtained from: School of Engineering, The University of Glasgow, Glasgow G12 8QQ. 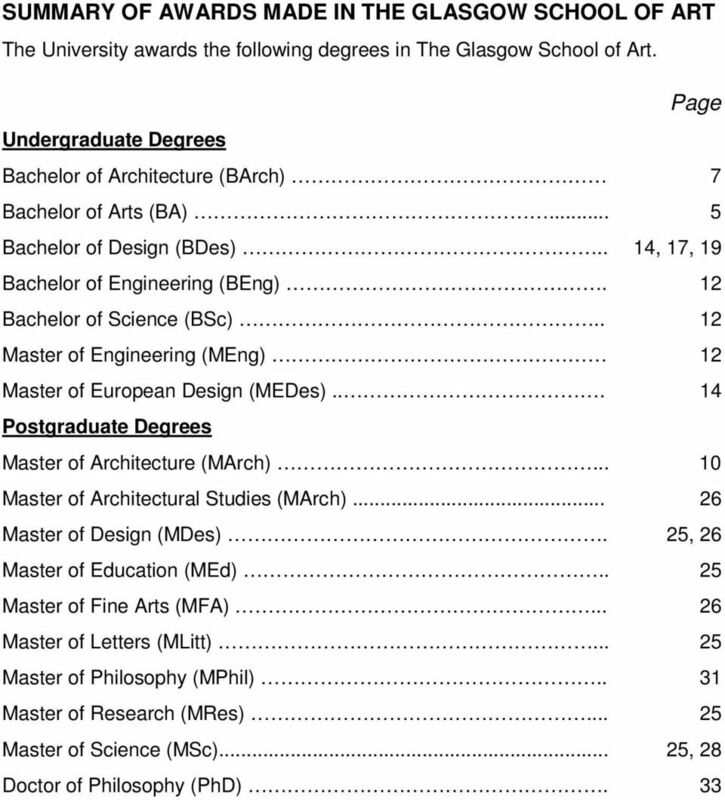 Tel: POSTGRADUATE STUDY The Glasgow School of Art offers taught postgraduate degrees as listed above in the section entitled Summary of Awards Made in the Glasgow School Of Art. APPLICATION Application for undergraduate degrees should be made through the Universities and Colleges Admissions Service (UCAS). Applications for postgraduate degrees should be made to Registry, The Glasgow School of Art, 167 Renfrew Street, Glasgow G3 6RQ. 5 Degrees of BA GSA.5 DEGREES OF BACHELOR OF ARTS IN DESIGN, BACHELOR OF ARTS IN FINE ART, BACHELOR OF ARTS IN COMMUNICATION DESIGN, BACHELOR OF ARTS IN INTERIOR DESIGN AND BACHELOR OF ARTS IN SILVERSMITHING AND JEWELLERY DESIGN RESOLUTION The Degrees of Bachelor of Arts in Design, Bachelor of Arts in Fine Art, Bachelor of Arts in Communication Design, Bachelor of Arts in Interior Design and Bachelor of Arts in Silversmithing and Jewellery Design are governed by Resolution No. 608 of the University Court which came into effect on 1 September 2008 with provision that: 1. The Degrees of Bachelor of Arts (BA) in Design, Bachelor of Arts (BA) in Fine Art, Bachelor of Arts (BA) in Communication Design, Bachelor of Arts (BA) in Interior Design and Bachelor of Arts (BA) in Silversmithing and Jewellery Design may be awarded by the Senate of the University of Glasgow in The Glasgow School of Art as Ordinary Degrees or as Degrees with Honours in such designations as may be prescribed by Regulations. 2. The Senate may make regulations governing the award of the Degrees which are subject to the approval of the University Court - these shall be as stated under Regulations below. 3. The early exit awards of Diploma of Higher Education and Certificate of Higher Education are also included in the Regulations. 4. The Senate recognises The Glasgow School of Art, through its Academic Council, as being corporately responsible for the administration and development of the courses leading to the Degrees. 5. It shall be the duty of the Academic Council of The Glasgow School of Art to consider annually the curricula for the Degrees and such other matters, including the admission and progress of students, as may be remitted to it by the Senate and to report to the Senate thereon. It shall be competent for the Academic Council to make recommendations to the Senate, with regard to the appointment of Examiners for the Degrees. 6. It shall be competent for the University Court, on the recommendation of the Senate, to recognise as teachers of the University for the purpose of the Degrees, such lecturers and other officers of The Glasgow School of Art having responsibility for courses qualifying for the Degrees, as may be proposed for such recognition by the Academic Council. 7. The Senate may appoint as an Examiner for the Degree of Bachelor of Arts but not as an External Examiner, any teacher recognised in accordance with 6 above. 8. The External Examiners for the Degrees shall be appointed by the University Court on the recommendation of the Academic Council and the Senate. REGULATIONS 1. Introductory and Definitions The definitions set out in the Glossary of Terms apply to these regulations. 2. Duration of Study The minimum and maximum periods of study, expressed as academic sessions, are as below: Type of award Full-time Part-time Minimum Maximum Minimum Maximum Honours degree Ordinary degree Diploma of Higher Education Certificate of Higher Education Recognition of Prior Learning 3.1 Prior certificated learning and prior experiential learning can be counted for credit on these degrees. 3.2 A candidate seeking accreditation of prior certificated learning must have completed, in whole or in part, a formally assessed programme of study. 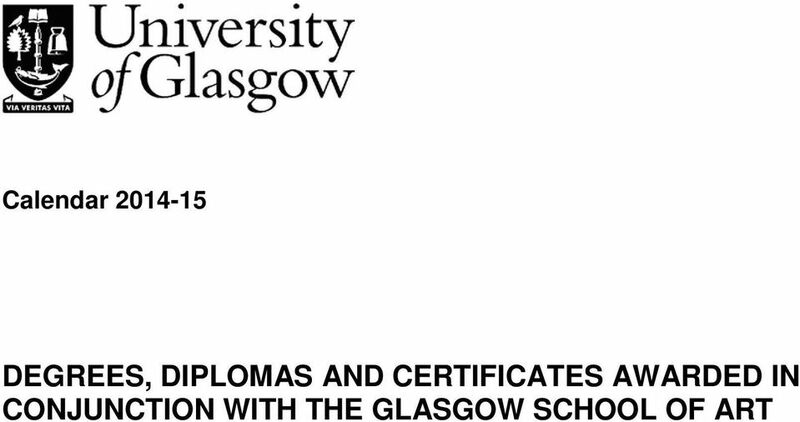 In addition to the documentation specified in the Admissions Policy published by The Glasgow School of Art, the candidate must present evidence of his/her achievement in the form of an original certificate, transcript or similar document and, where relevant, must also present details of the syllabus and form of assessment. 3.3 A candidate seeking accreditation of prior experiential learning is required, in addition to the documentation specified in the relevant policy, to provide evidence that will enable admissions tutors to make informed judgements about the level of learning, knowledge and skills that he/she has acquired through life experience, employment, work experience or study that is not formally recognised. 3.4 The procedure for approval of such accreditation is set out in the Admissions Policy published by The Glasgow School of Art. The maximum limit for the award of such credit is, other than in exceptional circumstances, 50% of the credits associated with the degree programme. 7 Degree of BArch GSA Award of a Certificate in Higher Education (in Communication Design Design, Fine Art Interior Design or Silversmithing and Jewellery Design ) 10.1 A candidate who has completed courses totalling at least 120 credits with grade D or better in each component shall be eligible to receive a Certificate of Higher Education unless the candidate proceeds immediately to a degree programme. This does not preclude the use in subsequent completion of a degree programme of credit counted towards the award of a Certificate of Higher Education The Certificate of Higher Education shall be awarded with Merit where the grade point average 1 is at least 12, and with Distinction where the grade point average is at least Where the candidate has accumulated more than 120 credits, the credit counted in the calculation of the grade point average shall be reduced to 120 credits by discarding all or part of the credit for certain of the courses in such a way as to maximise the grade point average while meeting all other requirements of the regulations. 11. Award of a Diploma of Higher Education (in Communication Design Design, Fine Art Interior Design or Silversmithing and Jewellery Design ) 11.1 A candidate who has completed courses totalling at least 240 credits, including at least 80 credits at level 2 or above, with grade D or better in each component shall be eligible to receive a Diploma of Higher Education unless the candidate proceeds immediately to a degree programme. This does not preclude the use in subsequent completion of a degree programme of credit counted towards the award of a Diploma of Higher Education The Diploma of Higher Education shall be awarded with Merit where the grade point average 1 is at least 12, and with Distinction where the grade point average is at least Where the candidate has accumulated more than 240 credits, the credit counted in the calculation of the grade point average shall be reduced to 240 credits by discarding all or part of the credit for certain of the courses in such a way as to maximise the grade point average while meeting all other requirements of the regulations. 12. Award of an Ordinary Degree 12.1 To be eligible for the award of an ordinary degree, the candidate must have obtained at least 360 credits at grade D or better. These must include at least 120 at level 2 or higher and at least 60 credits at level The ordinary degree shall be awarded with Merit where the grade point average 1 is at least 12, and with Distinction where the grade point average is at least Where the candidate has accumulated more than 360 credits, the credit counted in the calculation of the grade point average shall be reduced to 360 credits by discarding all or part of the credit for certain of the courses in such a way as to maximise the grade point average while meeting all other requirements of the regulations. 13. Award of an Honours Degree To be eligible for the award of an Honours degree, the candidate must have obtained at least 480 credits, including at least 120 level H credits at grade D or better and achieved grade D3 or better for a piece of independent work worth at least 20 credits. DEGREE OF BACHELOR OF ARCHITECTURE RESOLUTION The Degree of Bachelor of Architecture is governed by Resolution No. 551 of the University Court which came into effect on 1 October 2005 with the following provisions. 1. 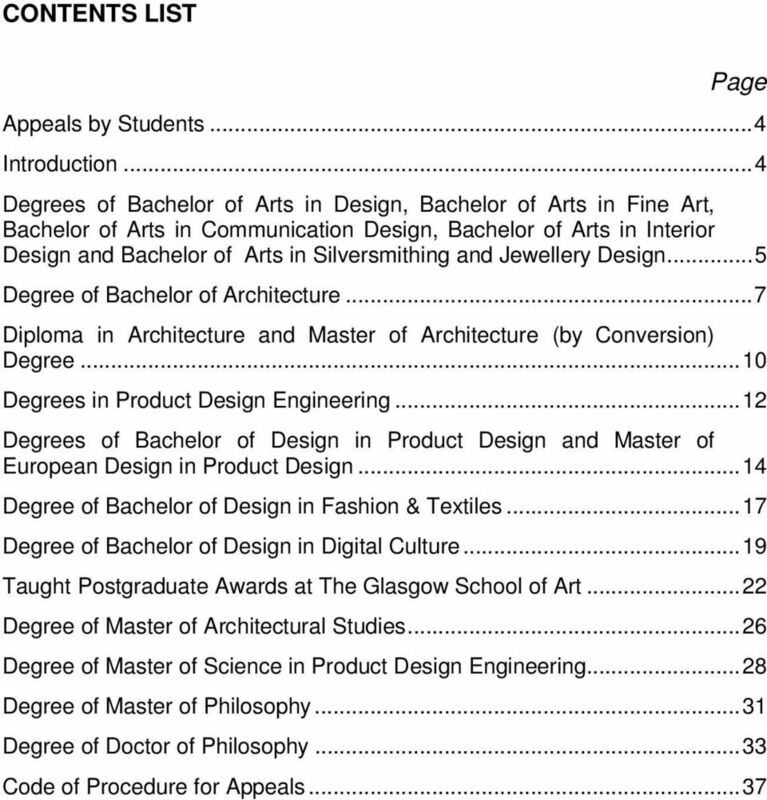 The Degree of Bachelor of Architecture (BArch) at The Glasgow School of Art may be awarded by the University of Glasgow either as an Ordinary Degree (on a full-time or a part-time basis) or as a Degree with Honours (fulltime or part-time with a final full-time year) in such designations as may be prescribed by Regulation. 2. The Senate may make Regulations, which are subject to the approval of the University Court, governing the award of the Degree - these shall be stated in the section entitled 'Regulations' below. 3. The Senate recognises The Glasgow School of Art, through its Academic Council, as being corporately responsible for the administration and development of the courses leading to the Degree of Bachelor of Architecture. 4. 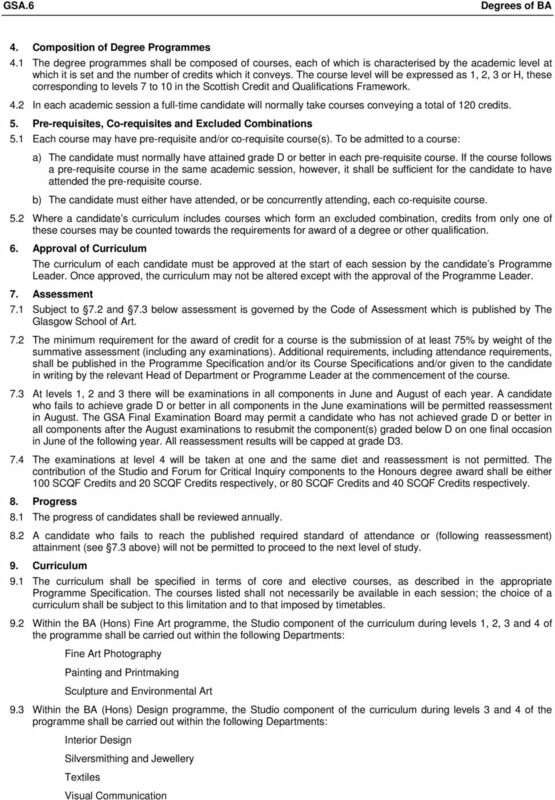 It shall be the duty of the Academic Council of The Glasgow School of Art to consider annually the curriculum 1 Grade point average is determined with reference to the schedule of grades and grade points contained in Schedule A of the GSA s Code of Assessment. The grade point average is calculated by taking the product of each course s weight and the candidate s grade points and dividing the sum of these products by the sum of the courses weights. The weights shall correspond to the courses credit ratings unless specified otherwise in the relevant programme documentation. Grade point average is expressed to one decimal place ( 4.4(a) of the Code of Assessment). In determining whether a candidate has achieved a required grade point average, no further rounding is permitted. Thus, a candidate achieving a grade point average of 8.9 would not satisfy a requirement for a grade point average of 9. 8 GSA.8 Degree of BArch for the Degree of Bachelor of Architecture and such other matters, including the admission and progress of students, as may be remitted to it by the Senate and to report to the Senate thereon. It shall be competent for the Academic Council to make recommendations to the Senate, with regard to the appointment of Examiners for the Degree. 5. It shall be competent for the University Court, on the recommendation of the Senate, to recognise as teachers of the University for the purpose of the Degree, such lecturers and other officers of The Glasgow School of Art having responsibility for courses qualifying for the Degree, as may be proposed for such recognition by the Academic Council. 6. The Senate may appoint as an Examiner for the Degree, but not as an External Examiner, any teacher recognised in accordance with 5 above. 7. The External Examiners for the Degree shall be appointed by the University Court on the recommendation of the Academic Council and the Senate. REGULATIONS Duration of Degree Study The minimum and maximum periods of study, expressed as academic sessions, are as below: Type of award Full-time Part-time Minimum Maximum Minimum Maximum Honours degree Ordinary degree Diploma of Higher Education Certificate of Higher Education a) The curriculum for the Ordinary Degree shall extend over no fewer than three sessions full-time or four sessions part-time. The curriculum for the Degree with Honours shall extend over no fewer than four sessions full-time, or four sessions part-time and one honours year full-time. b) Candidates engaged in part-time study will be required to spend no fewer than 1½ days per week in attendance on courses or in supervised study. The remaining time will be spent employed in an architect s office approved by the Head of the Mackintosh School of Architecture. c) The Academic Council of The Glasgow School of Art may recognise attendance given and examinations passed in another institution; provided always that every candidate whose attendance and examinations are thus recognised shall attend qualifying courses for at least two academic years (including the final year of the curriculum) at The Glasgow School of Art. 1.2 Every candidate for the Degree of Bachelor of Architecture must attend, for the minimum period of study stipulated in the Regulations, courses of instruction in The Glasgow School of Art, except that the Academic Council may recognise attendance given and examinations passed in another institution specially recognised by the University Court on the recommendation of the Senate; provided always that every candidate whose attendance or examinations are thus recognised, shall normally attend qualifying courses for at least two academic years fulltime or three academic years part-time for the Ordinary Degree or three academic years full-time for the Degree with Honours or, in the case of part-time candidates, three academic years part-time and one academic year fulltime for the Degree with Honours (in each case including the final year of the curriculum) in The Glasgow School of Art and shall pass the Degree examinations appropriate to these courses. 2. General Structure and Assessment of Degree 2.1 Courses taught within The Mackintosh School of Architecture will bear the following credits: Stage 1 Full-time and Part-time routes 120 credits per academic year Stage 2 Full-time and Part-time routes 120 credits per academic year Stage 3 Full-time route 120 credits per academic year or Stage 3 Part-time over two years (3a and 3b) 60 credits per academic year Stage 4 Full-time routes only 120 credits per academic year 2.2 The Degree of Bachelor of Architecture follows a prescribed curriculum. 2.3 The minimum requirement for the award of credits is the submission of at least 75% by weight of the course's summative assessment (including any examinations). Further requirements may include monitored attendance at classes and examinations. All such requirements shall be specified by the Mackintosh School of Architecture, and given to candidates in writing at the beginning of the course. Normally no grade or credits shall be awarded to a candidate who has not met these requirements. 9 Degree of BArch GSA Regulations for assessment can be found in the Programme Specification. 3. Progress of Students 3.1 a) The curriculum for the First and Second Years may be undertaken by full-time or part-time study; curriculum for the Third and Fourth Years can be undertaken by full-time study, or alternatively, if undertaken by part-time study (P3 and P4) the Third Year must be followed by full-time study in the Honours Year. Stage 1 Stage 2 Stage 3 Practical year out Stage 4 (hons) Full time mode F1 F2 F3 Y1 F4 Part time mode P1 P2 P3 P4 N/A N/A b) A part-time candidate so eligible must, if admission to Honours is finally approved, enter the Fourth Year of the full-time Honours course. Alternatively, a part-time candidate who has completed the full Ordinary Degree curriculum after four years of part-time study and who has graduated may be permitted to enter the First Year of the Diploma course. c) A candidate may be refused admission if previous performance does not offer a reasonable prospect of reaching the standard required but a candidate so refused admission will have the right of appeal to the Sub- Committee for Student Progress, submitting for its consideration any relevant special circumstances. d) A candidate, full-time or part-time, at the end of each year will satisfy the examiners and be eligible to pass to the next year of the course if: i) he/she has achieved a grade of at least D for all elements in the year s work. 3.2 a) In all cases, a candidate who has passed the year s work in the third term diet of examinations will be so informed. A First, Second or Third Year candidate who has failed the year s work at that diet must retake all programme elements in which he/she has not attained a grade of at least D: subjects which have been passed in the third term diet will not be retaken and the mark will stand. A candidate resitting in August will be informed whether he/she has passed on the same criteria as above. A candidate who fails in August a course of 20 credits or less should be permitted to repeat that course in the following session. A candidate who fails in August courses totalling more than 20 credits must repeat all courses from that session but shall retain any credits previously attained. b) A Fourth Year full-time Honours candidate, in order to complete the Year s work successfully, must: i) attain a grade of at least D in each of the following subjects, Studio Work 4 Architectural Technology 4 Research Project 4 Professional Studies a) A candidate, full-time or part-time, on the Ordinary Degree course, or a Third Year candidate on the Honours Degree course, may be excluded from further study for the relevant degree if in any year he/she has not completed satisfactorily the progress requirements set out above. b) A candidate, full-time or part-time, on the Ordinary Degree course, or a Third Year candidate on the Honours Degree course, will be excluded from further study if after a repeat year of study he/she has failed to complete satisfactorily the progress requirements. c) A Fourth Year candidate on the Honours Degree course will be excluded from further study for Honours if at the end of that year he/she has not completed satisfactorily all the requirements set out above. 3.4 Decisions on progress, including the exclusion of a candidate for any of the reasons given above, shall be taken by the Sub-Committee for Student Progress. A candidate shall have the right of appeal in accordance with the Code of Appeals which is set out in later pages of this section. 4. Specific Structure of the Degree and the Awards Associated with it 4.1 a) A candidate for the Degree with Honours will undertake the programme of study for his/her Research Project subjects under the supervision of a member of staff from the appropriate subject area. If the candidate does not maintain regular and frequent contact with his/her supervisor or produce work of a satisfactory standard he/she will not be permitted to present him/herself for final assessment. b) Before the end of each session the schemes of examinations for the Ordinary Degree for the next session shall be submitted by the Board of Studies for approval by the Academic Council and by the Senate. Each scheme of examination must include in addition to the number and duration of written papers required as Degree examinations at the regular diets of examination, a statement of the conditions under which these papers are to be taken, any other work to be taken into consideration by the examiners in assessment of the candidates, and the relative weight to be attached by the examiners to such other work and to the several parts of the Degree examinations. 10 GSA.10 Diploma in Architecture and Master of Architecture (by conversion) Degree c) A scheme of examinations at the Honours standard shall be approved by the Academic Council and by the Senate not less than two years before the diet of examination to which it applies; but the Academic Council and the Senate may, in special circumstances and not later than one year before the diet of examination, allow modifications which shall be notified to all candidates for Honours. d) All written Degree examinations and final assessments for the Degree with Honours shall be taken at one and the same diet in the third term of the Fourth Year; except with the approval of the Academic Council and Senate on special cause shown, a candidate who has presented him/herself for examination at the Honours standard may not present him/herself at a subsequent diet. e) There shall be four classes of Honours in which the candidates shall be arranged on the merit of the performances in the whole examination. The classes of Honours are first, upper second, lower second and third. f) If a candidate, having duly completed the work in his/her Honours subject or subjects, is prevented by illness medically certified or other good cause from presenting him/herself for the Honours examination, or, having begun it, from completing it, assessment will be conducted in accordance with 5 of the GSA s Code of Assessment. g) A candidate who has completed the curriculum for the Degree with Honours but who has failed to reach the standard required for the award of Honours may, if in the opinion of the GSA Final Examination Board he/she has given evidence of sufficient attainment, be exempted in whole or in part from the examination prescribed for the Ordinary Degree. 4.2 Full time candidates are recommended to undertake a year of practical experience at the end of Third Year. For further details see the Programme Specification. 4.3 A graduate of this University or of another University or institution of tertiary education recognised for this purpose by the Senate, may be permitted in consultation with the Professor of Architecture to enrol on the course, complete the assessment elements of the course and receive certification of the outcome of the assessment. DIPLOMA IN ARCHITECTURE AND MASTER OF ARCHITECTURE (BY CONVERSION) DEGREE RESOLUTION The Degree of Master of Architecture (By Conversion) is governed by Resolution of the University Court with provision that: 1. 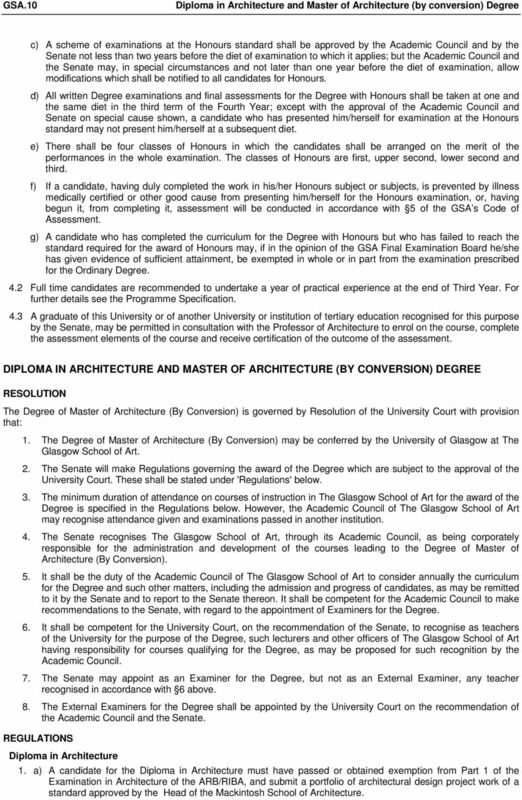 The Degree of Master of Architecture (By Conversion) may be conferred by the University of Glasgow at The Glasgow School of Art. 2. The Senate will make Regulations governing the award of the Degree which are subject to the approval of the University Court. These shall be stated under 'Regulations' below. 3. 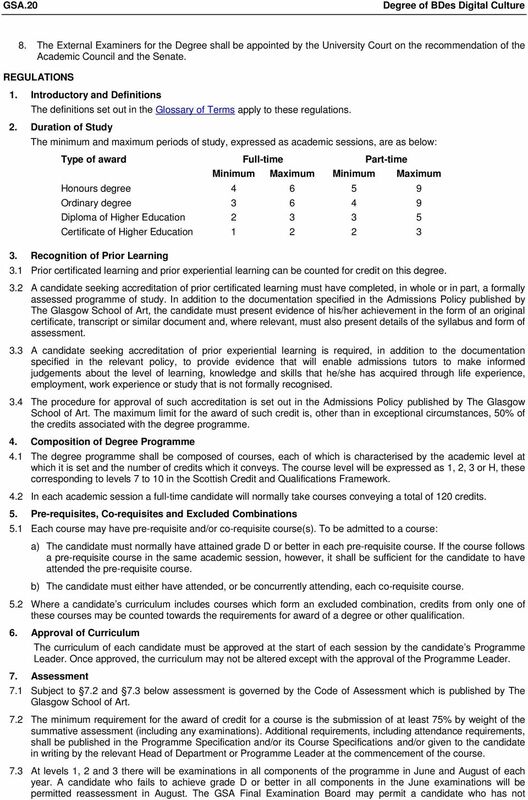 The minimum duration of attendance on courses of instruction in The Glasgow School of Art for the award of the Degree is specified in the Regulations below. However, the Academic Council of The Glasgow School of Art may recognise attendance given and examinations passed in another institution. 4. The Senate recognises The Glasgow School of Art, through its Academic Council, as being corporately responsible for the administration and development of the courses leading to the Degree of Master of Architecture (By Conversion). 5. It shall be the duty of the Academic Council of The Glasgow School of Art to consider annually the curriculum for the Degree and such other matters, including the admission and progress of candidates, as may be remitted to it by the Senate and to report to the Senate thereon. It shall be competent for the Academic Council to make recommendations to the Senate, with regard to the appointment of Examiners for the Degree. 6. 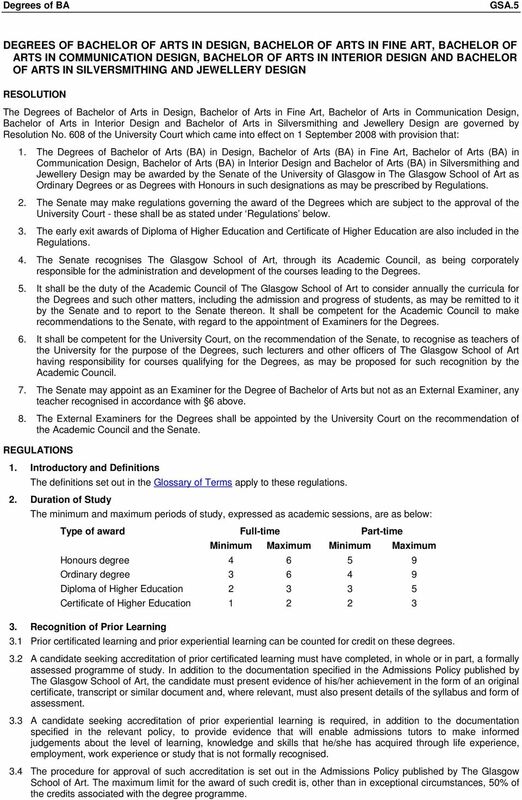 It shall be competent for the University Court, on the recommendation of the Senate, to recognise as teachers of the University for the purpose of the Degree, such lecturers and other officers of The Glasgow School of Art having responsibility for courses qualifying for the Degree, as may be proposed for such recognition by the Academic Council. 7. The Senate may appoint as an Examiner for the Degree, but not as an External Examiner, any teacher recognised in accordance with 6 above. 8. The External Examiners for the Degree shall be appointed by the University Court on the recommendation of the Academic Council and the Senate. REGULATIONS Diploma in Architecture 1. a) A candidate for the Diploma in Architecture must have passed or obtained exemption from Part 1 of the Examination in Architecture of the ARB/RIBA, and submit a portfolio of architectural design project work of a standard approved by the Head of the Mackintosh School of Architecture. 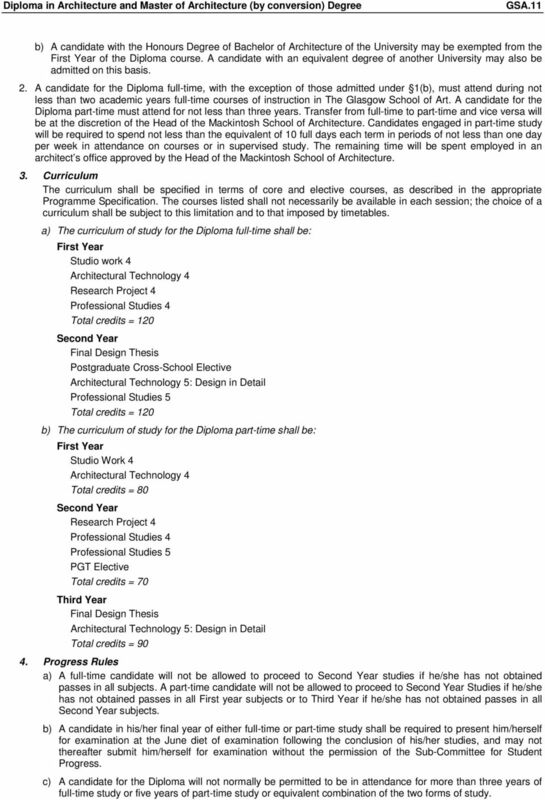 11 Diploma in Architecture and Master of Architecture (by conversion) Degree GSA.11 b) A candidate with the Honours Degree of Bachelor of Architecture of the University may be exempted from the First Year of the Diploma course. A candidate with an equivalent degree of another University may also be admitted on this basis. 2. A candidate for the Diploma full-time, with the exception of those admitted under 1(b), must attend during not less than two academic years full-time courses of instruction in The Glasgow School of Art. A candidate for the Diploma part-time must attend for not less than three years. Transfer from full-time to part-time and vice versa will be at the discretion of the Head of the Mackintosh School of Architecture. Candidates engaged in part-time study will be required to spend not less than the equivalent of 10 full days each term in periods of not less than one day per week in attendance on courses or in supervised study. The remaining time will be spent employed in an architect s office approved by the Head of the Mackintosh School of Architecture. 3. Curriculum The curriculum shall be specified in terms of core and elective courses, as described in the appropriate Programme Specification. The courses listed shall not necessarily be available in each session; the choice of a curriculum shall be subject to this limitation and to that imposed by timetables. a) The curriculum of study for the Diploma full-time shall be: First Year Studio work 4 Architectural Technology 4 Research Project 4 Professional Studies 4 Total credits = 120 Second Year Final Design Thesis Postgraduate Cross-School Elective Architectural Technology 5: Design in Detail Professional Studies 5 Total credits = 120 b) The curriculum of study for the Diploma part-time shall be: First Year Studio Work 4 Architectural Technology 4 Total credits = 80 Second Year Research Project 4 Professional Studies 4 Professional Studies 5 PGT Elective Total credits = 70 Third Year Final Design Thesis Architectural Technology 5: Design in Detail Total credits = Progress Rules a) A full-time candidate will not be allowed to proceed to Second Year studies if he/she has not obtained passes in all subjects. A part-time candidate will not be allowed to proceed to Second Year Studies if he/she has not obtained passes in all First year subjects or to Third Year if he/she has not obtained passes in all Second Year subjects. b) A candidate in his/her final year of either full-time or part-time study shall be required to present him/herself for examination at the June diet of examination following the conclusion of his/her studies, and may not thereafter submit him/herself for examination without the permission of the Sub-Committee for Student Progress. c) A candidate for the Diploma will not normally be permitted to be in attendance for more than three years of full-time study or five years of part-time study or equivalent combination of the two forms of study. 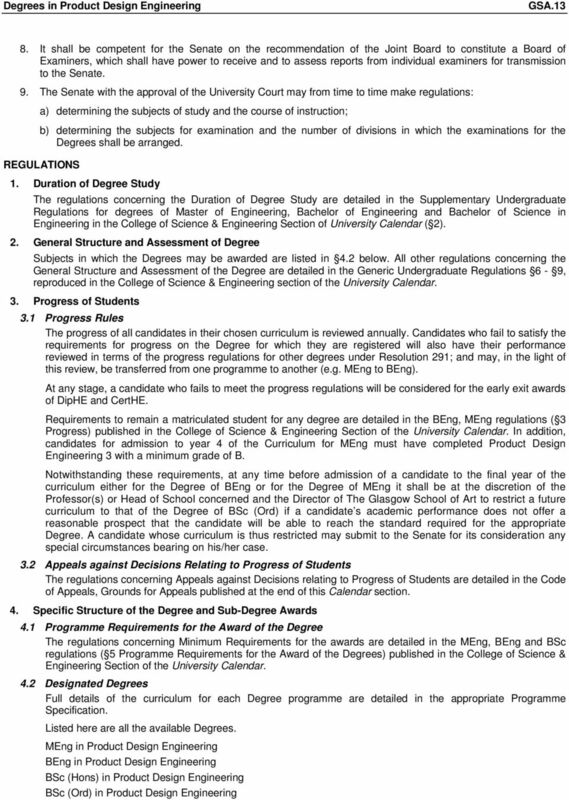 12 GSA.12 Degrees in Product Design Engineering d) Decisions on progress, including the exclusion of a candidate for any of the reasons given in a) to d) above, shall be taken by the Sub-Committee for Student Progress. A candidate shall have the right of appeal in accordance with the Code of Appeals. 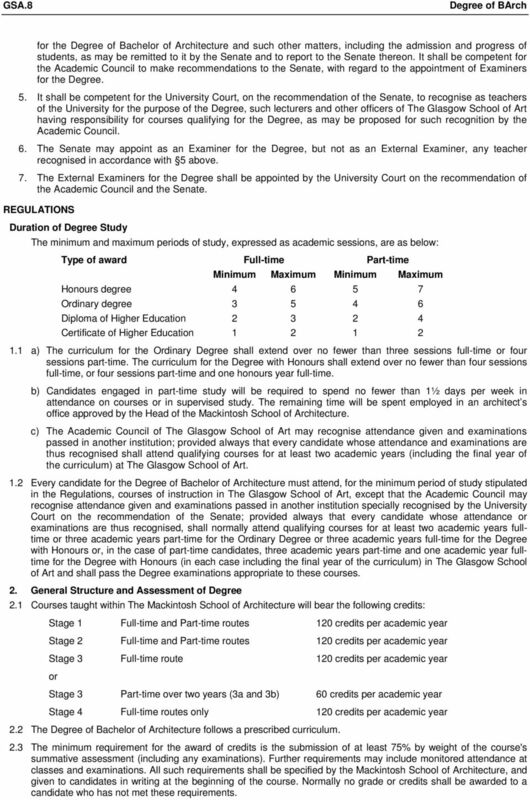 Admission to the Degree of Master of Architecture (by Conversion) A Diploma in Architecture candidate assessed by the GSA Final Examination Board as having achieved an A or B grade in the specific course they wish to pursue through extended study shall be given the option of undertaking additional studies, and submitting for the Degree of Master of Architecture (by Conversion). Alternatively a candidate may present to the Head of the Mackintosh School of Architecture an argued case to proceed to a further term of study of a particular aspect of Architecture in relation to the Final Design Thesis or Research Project 5. A candidate so transferred will enrol for a further period of 15 weeks full-time supervised study at the Mackintosh School of Architecture, commencing in the first term of the following session, and will submit work at the conclusion of this period for examination for the Degree of MArch; or, a candidate will enrol for a further period of 30 weeks of parttime supervised study at the Mackintosh School of Architecture, and will submit work at the conclusion of this period, i.e. in June for examination for the Degree of MArch (by Conversion). Exceptionally, the Sub-Committee for Student Progress may permit a candidate who does not submit for the Degree at the conclusion of the period of further study to undertake an additional period of part-time study before submitting. A candidate so transferred will undertake the Specialist Studies course of 60 credits, gaining 180 credits overall when combined with 120 credits from Diploma Year 2. 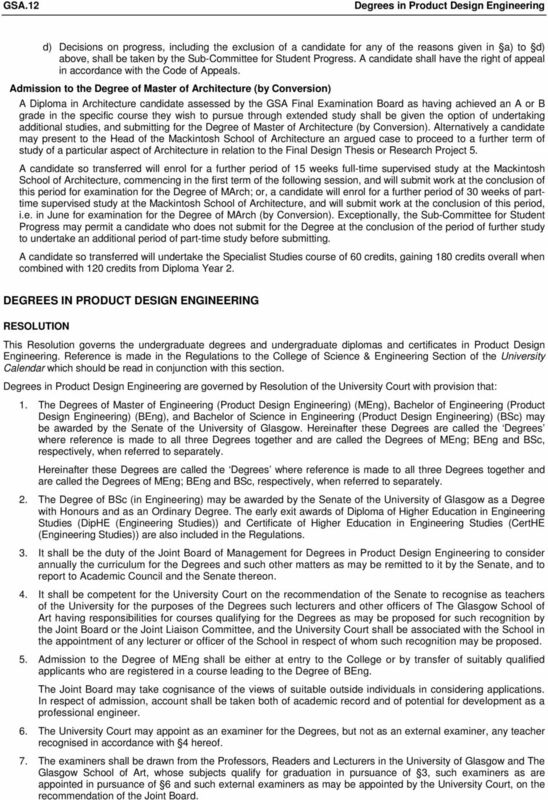 DEGREES IN PRODUCT DESIGN ENGINEERING RESOLUTION This Resolution governs the undergraduate degrees and undergraduate diplomas and certificates in Product Design Engineering. Reference is made in the Regulations to the College of Science & Engineering Section of the University Calendar which should be read in conjunction with this section. Degrees in Product Design Engineering are governed by Resolution of the University Court with provision that: 1. The Degrees of Master of Engineering (Product Design Engineering) (MEng), Bachelor of Engineering (Product Design Engineering) (BEng), and Bachelor of Science in Engineering (Product Design Engineering) (BSc) may be awarded by the Senate of the University of Glasgow. Hereinafter these Degrees are called the Degrees where reference is made to all three Degrees together and are called the Degrees of MEng; BEng and BSc, respectively, when referred to separately. Hereinafter these Degrees are called the Degrees where reference is made to all three Degrees together and are called the Degrees of MEng; BEng and BSc, respectively, when referred to separately. 2. The Degree of BSc (in Engineering) may be awarded by the Senate of the University of Glasgow as a Degree with Honours and as an Ordinary Degree. The early exit awards of Diploma of Higher Education in Engineering Studies (DipHE (Engineering Studies)) and Certificate of Higher Education in Engineering Studies (CertHE (Engineering Studies)) are also included in the Regulations. 3. It shall be the duty of the Joint Board of Management for Degrees in Product Design Engineering to consider annually the curriculum for the Degrees and such other matters as may be remitted to it by the Senate, and to report to Academic Council and the Senate thereon. 4. It shall be competent for the University Court on the recommendation of the Senate to recognise as teachers of the University for the purposes of the Degrees such lecturers and other officers of The Glasgow School of Art having responsibilities for courses qualifying for the Degrees as may be proposed for such recognition by the Joint Board or the Joint Liaison Committee, and the University Court shall be associated with the School in the appointment of any lecturer or officer of the School in respect of whom such recognition may be proposed. 5. Admission to the Degree of MEng shall be either at entry to the College or by transfer of suitably qualified applicants who are registered in a course leading to the Degree of BEng. The Joint Board may take cognisance of the views of suitable outside individuals in considering applications. In respect of admission, account shall be taken both of academic record and of potential for development as a professional engineer. 6. The University Court may appoint as an examiner for the Degrees, but not as an external examiner, any teacher recognised in accordance with 4 hereof. 7. The examiners shall be drawn from the Professors, Readers and Lecturers in the University of Glasgow and The Glasgow School of Art, whose subjects qualify for graduation in pursuance of 3, such examiners as are appointed in pursuance of 6 and such external examiners as may be appointed by the University Court, on the recommendation of the Joint Board. 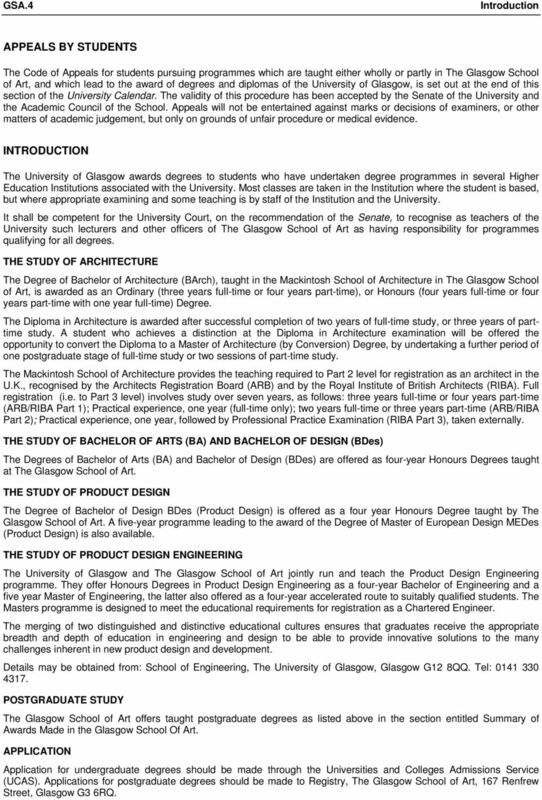 14 GSA.14 Degrees of BDes (Product Design) and MEDes (Product Design) DEGREES OF BACHELOR OF DESIGN IN PRODUCT DESIGN AND MASTER OF EUROPEAN DESIGN IN PRODUCT DESIGN RESOLUTION The Degrees in Product Design at The Glasgow School of Art will be governed by Resolution of the University Court which are currently in draft form with provision that: 1. The Degree of Bachelor of Design (BDes) in Product Design and Master of European Design (MEDes) in Product Design at The Glasgow School of Art shall be awarded by the Senate of the University of Glasgow. Hereinafter these Degrees are termed the Degrees where reference is made to both, and the Degrees of Bachelor of Design in Product Design and Master of European Design in Product Design respectively, when referred to separately. 2. The Degree of Bachelor of Design in Product Design may be awarded as an Ordinary Degree or as a Degree with Honours. The early exit awards of Certificate of Higher Education in Product Design and Diploma of Higher Education in Product Design are also included in the Regulations. 3. The Senate recognises The Glasgow School of Art, through its Academic Council, as being corporately responsible for the administration and development of the courses leading to the Degrees. 4. It shall be competent for the University Court, on the recommendation of the Senate, to recognise as teachers of the University for the purpose of the Degrees, such lecturers and other officers of The Glasgow School of Art having responsibility for courses qualifying for the Degrees, as may be proposed for such recognition by the Academic Council. 5. It shall be the duty of the Academic Council of The Glasgow School of Art to consider annually the curriculum for the Degrees and such other matters, including the admission and progress of students, as may be remitted to it by the Senate and to report to the Senate thereon. It shall be competent for the Academic Council to make recommendations to the Senate, with regard to the appointment of Examiners for the Degrees. 6. The External Examiner(s) for the Degrees shall be appointed by the University Court on the recommendation of the Academic Council and the Senate. REGULATIONS 1. Introductory and Definitions The definitions set out in the Glossary of Terms apply to these regulations. 2. Duration of Study The minimum and maximum periods of study, expressed as academic sessions, are as below: Type of award Full-time Part-time Minimum Maximum Minimum Maximum Masters Degree Honours Degree Ordinary Degree Diploma of Higher Education Certificate of Higher Education Recognition of prior learning 3.1 Prior certificated learning and prior experiential learning can be counted for credit on this degree. 3.2 A candidate seeking accreditation of prior certificated learning must have completed, in whole or in part, a formally assessed programme of study. 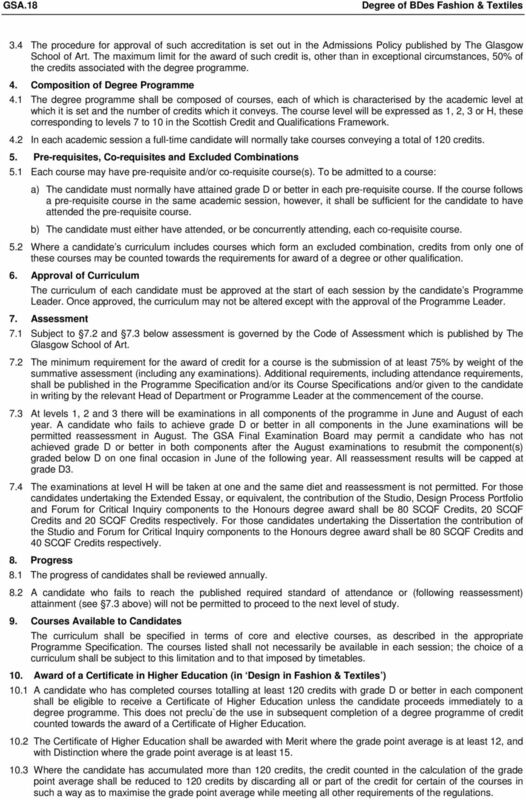 In addition to the documentation specified in the Admissions Policy published by The Glasgow School of Art, the candidate must present evidence of achievement in the form of an original certificate, transcript or similar document and, where relevant, must also present details of the syllabus and form of assessment. 3.3 A candidate seeking accreditation of prior experiential learning is required, in addition to the documentation specified in the relevant policy, to provide evidence that will enable admissions tutors to make informed judgements about the level of learning, knowledge and skills that they have acquired through life experience, employment, work experience or study that is not formally recognised. 3.4 The procedure for approval of such accreditation is set out in the relevant policy published by The Glasgow School of Art. The maximum limit for the award of such credit is, other than in exceptional circumstances, 50% of the credits associated with the degree programme. 15 Degrees of BDes (Product Design) and MEDes (Product Design) GSA Composition of Degree Programmes 4.1 The degree programme shall be composed of courses, each of which is characterised by the academic level at which it is set and the number of credits which it conveys. The course level will be expressed as 1, 2, 3, H or M, these corresponding to levels 7 to 11 in the Scottish Credit and Qualifications Framework. 4.2 In each academic session a full-time candidate will normally take courses conveying a total of 120 credits. 5. Pre-requisites, Co-requisites and Excluded Combinations 5.1 Each course may have pre-requisite and/or co-requisite course(s). To be admitted to a course: a) The candidate must normally have attained grade D or better in each pre-requisite course. If the course follows a pre-requisite course in the same academic session, however, it shall be sufficient for the candidate to have attended the pre-requisite course. b) The candidate must either have attended, or be concurrently attending, each co-requisite course. 5.2 Where a candidate s curriculum includes courses which form an excluded combination, credits from only one of these courses may be counted towards the requirements for award of a degree or other qualification. 6. Approval of Curriculum The curriculum of each candidate must be approved at the start of each session by the candidate s Programme Leader. Once approved, the curriculum may not be altered except with the approval of the Programme Leader. 7. Assessment 7.1 Subject to 7.2 and 7.3 below assessment is governed by the Code of Assessment which is published by The Glasgow School of Art. 7.2 The minimum requirement for the award of credit for a course is the submission of at least 75% by weight of the summative assessment (including any examinations). Additional requirements, including attendance requirements, shall be published in the Programme Specification and/or its Course Specifications and/or given to candidates in writing by the relevant Head of Department or programme leader at the commencement of the course. 7.3 At levels 1, 2 and 3 there will be examinations in Studio, Forum for Critical Inquiry, Language Studies and Social Sciences in June and August of each year. A candidate who fails to achieve grade D or better in all components in the June examinations will be permitted reassessment in August. The GSA Final Examination Board may permit a candidate who has not achieved grade D or better in all components after the August examinations to resubmit the component(s) graded below D on one final occasion in June of the following year. All reassessment results will be capped at grade D The examinations at level H will be taken at one and the same diet and reassessment is not permitted. The contribution of the Studio, Forum for Critical Inquiry and Social Science components to the Honours degree award shall be 67%, 25% and 8% respectively 7.5 The examinations at level M will be taken at one and the same diet. The contribution of the Studio, Forum for Critical Inquiry and Social Science components to the Masters degree award shall be 67%, 25% and 8% respectively 8. Progress 8.1 The progress of candidates shall be reviewed annually. 8.2 A candidate who fails to reach the published required standard of attendance or (following reassessment) attainment will not be permitted to proceed to the next level of study. 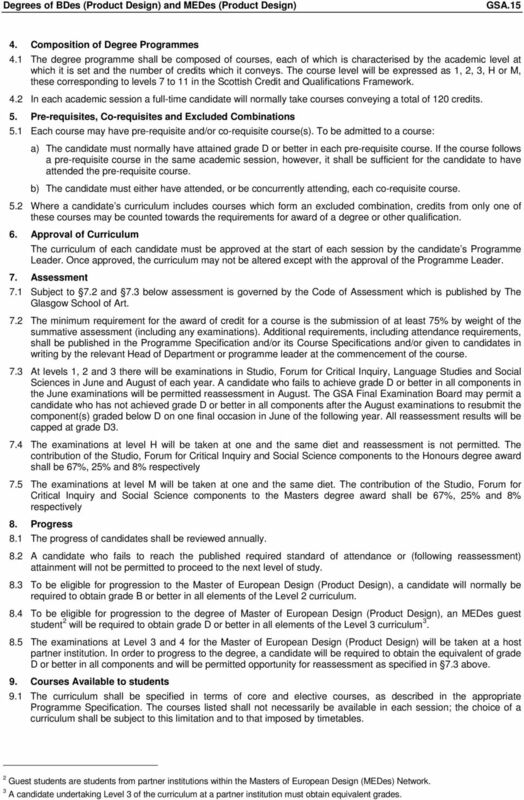 8.3 To be eligible for progression to the Master of European Design (Product Design), a candidate will normally be required to obtain grade B or better in all elements of the Level 2 curriculum. 8.4 To be eligible for progression to the degree of Master of European Design (Product Design), an MEDes guest student 2 will be required to obtain grade D or better in all elements of the Level 3 curriculum The examinations at Level 3 and 4 for the Master of European Design (Product Design) will be taken at a host partner institution. In order to progress to the degree, a candidate will be required to obtain the equivalent of grade D or better in all components and will be permitted opportunity for reassessment as specified in 7.3 above. 9. Courses Available to students 9.1 The curriculum shall be specified in terms of core and elective courses, as described in the appropriate Programme Specification. The courses listed shall not necessarily be available in each session; the choice of a curriculum shall be subject to this limitation and to that imposed by timetables. 2 Guest students are students from partner institutions within the Masters of European Design (MEDes) Network. 3 A candidate undertaking Level 3 of the curriculum at a partner institution must obtain equivalent grades. 16 GSA.16 Degrees of BDes (Product Design) and MEDes (Product Design) 10. Award of a Certificate in Higher Education in Product Design 10.1 A candidate who has completed courses totalling at least 120 credits with grade D or better in each component shall be eligible to receive a Certificate of Higher Education unless the candidate proceeds immediately to a degree programme. This does not preclude the use in subsequent completion of a degree programme of credit counted towards the award of a Certificate of Higher Education The Certificate of Higher Education shall be awarded with Merit where the grade point average 4 is at least 12, and with Distinction where the grade point average is at least Where the candidate has accumulated more than 120 credits, the credit counted in the calculation of the grade point average shall be reduced to 120 credits by discarding all or part of the credit for certain of the courses in such a way as to maximise the grade point average while meeting all other requirements of the regulations. 11. Award of a Diploma of Higher Education in Product Design 11.1 A candidate who has completed courses totalling at least 240 credits, including at least 80 credits at level 2 or above, with grade D or better in each component shall be eligible to receive a Diploma of Higher Education unless the candidate proceeds immediately to a degree programme. This does not preclude the use in subsequent completion of a degree programme of credit counted towards the award of a Diploma of Higher Education The Diploma of Higher Education shall be awarded with Merit where the grade point average 4 is at least 12, and with Distinction where the grade point average is at least Where the candidate has accumulated more than 240 credits, the credit counted in the calculation of the grade point average shall be reduced to 240 credits by discarding all or part of the credit for certain of the courses in such a way as to maximise the grade point average while meeting all other requirements of the regulations. 12. Award of an Ordinary Degree 12.1 To be eligible for the award of an ordinary degree in Product Design, the candidate must have obtained at least 360 credits at grade D or better. These must include at least 120 must at level 2 or higher and at least 60 credits at level The ordinary degree shall be awarded with merit where the grade point average 4 is at least 12, and with distinction where the grade point average is at least Where the candidate has accumulated more than 360 credits, the credit counted in the calculation of the grade point average shall be reduced to 360 credits by discarding all or part of the credit for certain of the courses in such a way as to maximise the grade point average while meeting all other requirements of the regulations Any candidate who, on completion of Level 3, has not met the requirements for continued progression to the degree of Bachelor of Design in Product Design with Honours may, at the discretion of the GSA Final Examination Board, be awarded the Degree of Bachelor of Design. 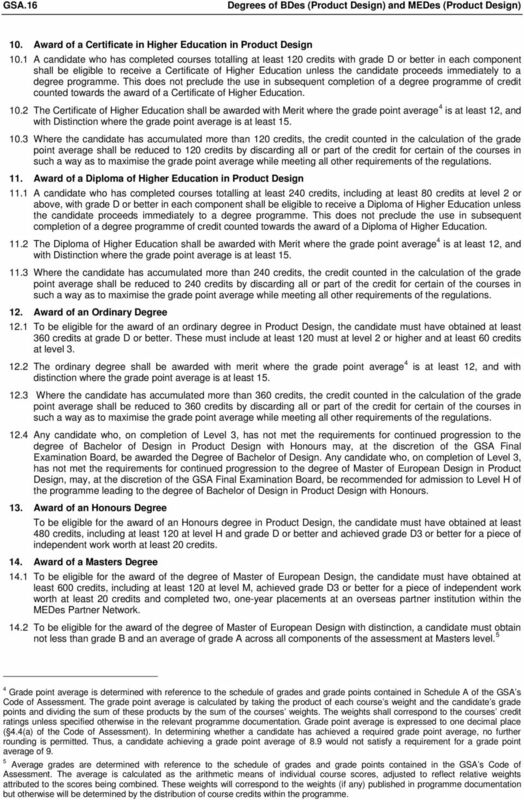 Any candidate who, on completion of Level 3, has not met the requirements for continued progression to the degree of Master of European Design in Product Design, may, at the discretion of the GSA Final Examination Board, be recommended for admission to Level H of the programme leading to the degree of Bachelor of Design in Product Design with Honours. 13. 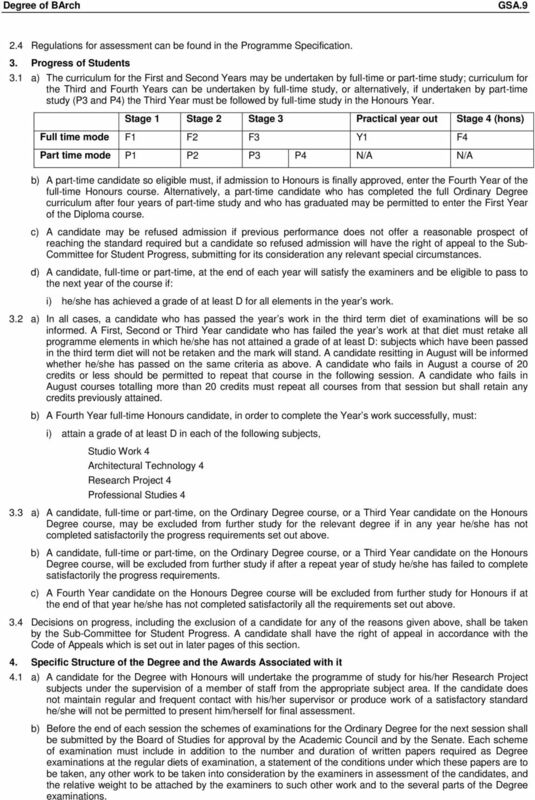 Award of an Honours Degree To be eligible for the award of an Honours degree in Product Design, the candidate must have obtained at least 480 credits, including at least 120 at level H and grade D or better and achieved grade D3 or better for a piece of independent work worth at least 20 credits. 14. Award of a Masters Degree 14.1 To be eligible for the award of the degree of Master of European Design, the candidate must have obtained at least 600 credits, including at least 120 at level M, achieved grade D3 or better for a piece of independent work worth at least 20 credits and completed two, one-year placements at an overseas partner institution within the MEDes Partner Network To be eligible for the award of the degree of Master of European Design with distinction, a candidate must obtain not less than grade B and an average of grade A across all components of the assessment at Masters level. 5 4 Grade point average is determined with reference to the schedule of grades and grade points contained in Schedule A of the GSA s Code of Assessment. The grade point average is calculated by taking the product of each course s weight and the candidate s grade points and dividing the sum of these products by the sum of the courses weights. The weights shall correspond to the courses credit ratings unless specified otherwise in the relevant programme documentation. Grade point average is expressed to one decimal place ( 4.4(a) of the Code of Assessment). In determining whether a candidate has achieved a required grade point average, no further rounding is permitted. Thus, a candidate achieving a grade point average of 8.9 would not satisfy a requirement for a grade point average of 9. 5 Average grades are determined with reference to the schedule of grades and grade points contained in the GSA s Code of Assessment. The average is calculated as the arithmetic means of individual course scores, adjusted to reflect relative weights attributed to the scores being combined. These weights will correspond to the weights (if any) published in programme documentation but otherwise will be determined by the distribution of course credits within the programme. 17 Degree of BDes Fashion & Textiles GSA Any candidate who has completed Level H but who has failed to meet the standard for progression to the degree of Master of European Design in Product Design may, at the discretion of the GSA Final Examination Board, be recommended for the Degree of Bachelor of Design in Product Design with Honours in an appropriate classification, or for the degree of Bachelor of Design in Product Design. Any such recommendation shall take into account the performance of the candidate in the Honours examinations and assessed course work in the final year of the programme. DEGREE OF BACHELOR OF DESIGN IN FASHION & TEXTILES RESOLUTION The Degree of Bachelor of Design in Fashion & Textiles is governed by Resolution No. 629 of the University Court, which came into effect on 1 September 2010, with provision that: 1. The Degree of Bachelor of Design (BDes) in Fashion & Textiles may be awarded by the Senate of the University of Glasgow in The Glasgow School of Art as an Ordinary Degree or as a Degree with Honours in such designations as may be prescribed by Regulations. 2. The Senate may make regulations governing the award of the Degree which is subject to the approval of the University Court - these shall be as stated under Regulations below. 3. The early exit awards of Diploma of Higher Education and Certificate of Higher Education are also included in the Regulations. 4. The Senate recognises The Glasgow School of Art, through its Academic Council, as being corporately responsible for the administration and development of the courses leading to the Degrees. 5. It shall be the duty of the Academic Council of The Glasgow School of Art to consider annually the curriculum for the Degree and such other matters, including the admission and progress of students, as may be remitted to it by the Senate and to report to the Senate thereon. It shall be competent for the Academic Council to make recommendations to the Senate, with regard to the appointment of Examiners for the Degree. 6. It shall be competent for the University Court, on the recommendation of the Senate, to recognise as teachers of the University for the purpose of the Degree, such lecturers and other officers of The Glasgow School of Art having responsibility for courses qualifying for the Degree, as may be proposed for such recognition by the Academic Council. 7. The Senate may appoint as an Examiner for the Degree, but not as an External Examiner, any teacher recognised in accordance with 6 above. 8. The External Examiners for the Degree shall be appointed by the University Court on the recommendation of the Academic Council and the Senate. REGULATIONS 1. Introductory and Definitions The definitions set out in the Glossary of Terms apply to these regulations. 2. Duration of Study The minimum and maximum periods of study, expressed as academic sessions, are as below: Type of award Full-time Part-time Minimum Maximum Minimum Maximum Honours degree Ordinary degree Diploma of Higher Education Certificate of Higher Education Recognition of Prior Learning 3.1 Prior certificated learning and prior experiential learning can be counted for credit on this degree. 3.2 A candidate seeking accreditation of prior certificated learning must have completed, in whole or in part, a formally assessed programme of study. 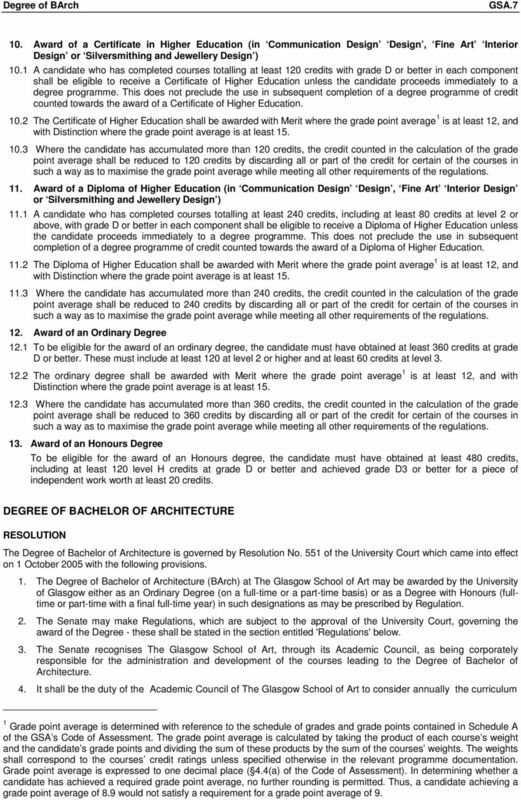 In addition to the documentation specified in the Admissions Policy published by The Glasgow School of Art, the candidate must present evidence of his/her achievement in the form of an original certificate, transcript or similar document and, where relevant, must also present details of the syllabus and form of assessment. 3.3 A candidate seeking accreditation of prior experiential learning is required, in addition to the documentation specified in the relevant policy, to provide evidence that will enable admissions tutors to make informed judgements about the level of learning, knowledge and skills that he/she has acquired through life experience, employment, work experience or study that is not formally recognised. 18 GSA.18 Degree of BDes Fashion & Textiles 3.4 The procedure for approval of such accreditation is set out in the Admissions Policy published by The Glasgow School of Art. The maximum limit for the award of such credit is, other than in exceptional circumstances, 50% of the credits associated with the degree programme. 4. Composition of Degree Programme 4.1 The degree programme shall be composed of courses, each of which is characterised by the academic level at which it is set and the number of credits which it conveys. The course level will be expressed as 1, 2, 3 or H, these corresponding to levels 7 to 10 in the Scottish Credit and Qualifications Framework. 4.2 In each academic session a full-time candidate will normally take courses conveying a total of 120 credits. 5. Pre-requisites, Co-requisites and Excluded Combinations 5.1 Each course may have pre-requisite and/or co-requisite course(s). To be admitted to a course: a) The candidate must normally have attained grade D or better in each pre-requisite course. If the course follows a pre-requisite course in the same academic session, however, it shall be sufficient for the candidate to have attended the pre-requisite course. b) The candidate must either have attended, or be concurrently attending, each co-requisite course. 5.2 Where a candidate s curriculum includes courses which form an excluded combination, credits from only one of these courses may be counted towards the requirements for award of a degree or other qualification. 6. Approval of Curriculum The curriculum of each candidate must be approved at the start of each session by the candidate s Programme Leader. Once approved, the curriculum may not be altered except with the approval of the Programme Leader. 7. Assessment 7.1 Subject to 7.2 and 7.3 below assessment is governed by the Code of Assessment which is published by The Glasgow School of Art. 7.2 The minimum requirement for the award of credit for a course is the submission of at least 75% by weight of the summative assessment (including any examinations). Additional requirements, including attendance requirements, shall be published in the Programme Specification and/or its Course Specifications and/or given to the candidate in writing by the relevant Head of Department or Programme Leader at the commencement of the course. 7.3 At levels 1, 2 and 3 there will be examinations in all components of the programme in June and August of each year. A candidate who fails to achieve grade D or better in all components in the June examinations will be permitted reassessment in August. The GSA Final Examination Board may permit a candidate who has not achieved grade D or better in both components after the August examinations to resubmit the component(s) graded below D on one final occasion in June of the following year. All reassessment results will be capped at grade D The examinations at level H will be taken at one and the same diet and reassessment is not permitted. For those candidates undertaking the Extended Essay, or equivalent, the contribution of the Studio, Design Process Portfolio and Forum for Critical Inquiry components to the Honours degree award shall be 80 SCQF Credits, 20 SCQF Credits and 20 SCQF Credits respectively. For those candidates undertaking the Dissertation the contribution of the Studio and Forum for Critical Inquiry components to the Honours degree award shall be 80 SCQF Credits and 40 SCQF Credits respectively. 8. Progress 8.1 The progress of candidates shall be reviewed annually. 8.2 A candidate who fails to reach the published required standard of attendance or (following reassessment) attainment (see 7.3 above) will not be permitted to proceed to the next level of study. 9. Courses Available to Candidates The curriculum shall be specified in terms of core and elective courses, as described in the appropriate Programme Specification. The courses listed shall not necessarily be available in each session; the choice of a curriculum shall be subject to this limitation and to that imposed by timetables. 10. Award of a Certificate in Higher Education (in Design in Fashion & Textiles ) 10.1 A candidate who has completed courses totalling at least 120 credits with grade D or better in each component shall be eligible to receive a Certificate of Higher Education unless the candidate proceeds immediately to a degree programme. This does not preclu`de the use in subsequent completion of a degree programme of credit counted towards the award of a Certificate of Higher Education The Certificate of Higher Education shall be awarded with Merit where the grade point average is at least 12, and with Distinction where the grade point average is at least Where the candidate has accumulated more than 120 credits, the credit counted in the calculation of the grade point average shall be reduced to 120 credits by discarding all or part of the credit for certain of the courses in such a way as to maximise the grade point average while meeting all other requirements of the regulations. 19 Degree of BDes Digital Culture GSA Award of a Diploma of Higher Education (in Design in Fashion & Textiles ) 11.1 A candidate who has completed courses totalling at least 240 credits, including at least 80 credits at level 2 or above, with grade D or better in each component shall be eligible to receive a Diploma of Higher Education unless the candidate proceeds immediately to a degree programme. This does not preclude the use in subsequent completion of a degree programme of credit counted towards the award of a Diploma of Higher Education The Diploma of Higher Education shall be awarded with Merit where the grade point average 6 is at least 12, and with Distinction where the grade point average is at least Where the candidate has accumulated more than 240 credits, the credit counted in the calculation of the grade point average shall be reduced to 240 credits by discarding all or part of the credit for certain of the courses in such a way as to maximise the grade point average while meeting all other requirements of the regulations. 12. Award of an Ordinary Degree 12.1 To be eligible for the award of the ordinary degree Bachelor of Design in Fashion & Textiles the candidate must have obtained at least 360 credits at grade D or better. These must include at least 120 at level 2 or higher and at least 60 credits at level The ordinary degree shall be awarded with Merit where the grade point average 6 is at least 12, and with Distinction where the grade point average is at least Where the candidate has accumulated more than 360 credits, the credit counted in the calculation of the grade point average shall be reduced to 360 credits by discarding all or part of the credit for certain of the courses in such a way as to maximise the grade point average while meeting all other requirements of the regulations. 13. Award of an Honours Degree To be eligible for the award of the Honours degree Bachelor of Design in Fashion & Textiles the candidate must have obtained at least 480 credits, including at least 120 level H credits at grade D or better and achieved a grade D3 or better for a piece of independent work worth at least 20 credits. 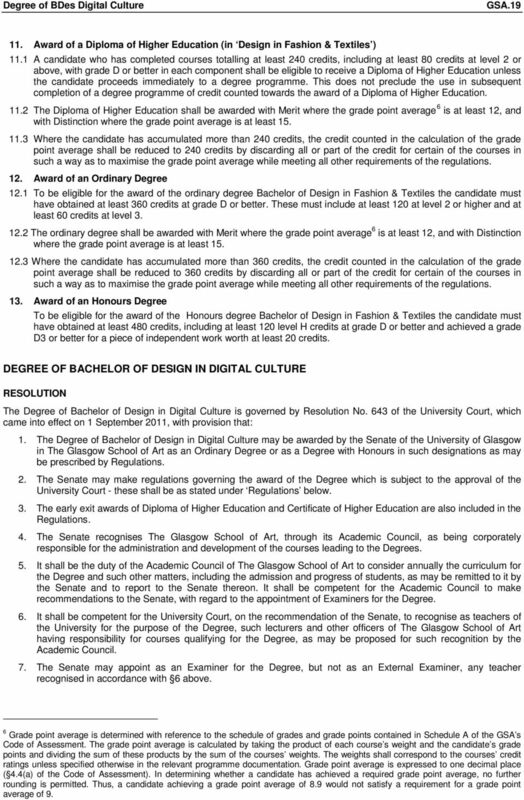 DEGREE OF BACHELOR OF DESIGN IN DIGITAL CULTURE RESOLUTION The Degree of Bachelor of Design in Digital Culture is governed by Resolution No. 643 of the University Court, which came into effect on 1 September 2011, with provision that: 1. 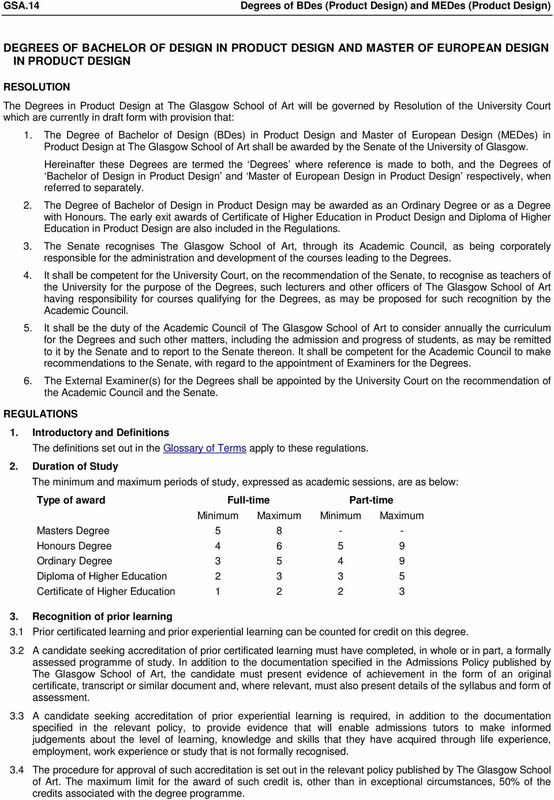 The Degree of Bachelor of Design in Digital Culture may be awarded by the Senate of the University of Glasgow in The Glasgow School of Art as an Ordinary Degree or as a Degree with Honours in such designations as may be prescribed by Regulations. 2. The Senate may make regulations governing the award of the Degree which is subject to the approval of the University Court - these shall be as stated under Regulations below. 3. The early exit awards of Diploma of Higher Education and Certificate of Higher Education are also included in the Regulations. 4. The Senate recognises The Glasgow School of Art, through its Academic Council, as being corporately responsible for the administration and development of the courses leading to the Degrees. 5. It shall be the duty of the Academic Council of The Glasgow School of Art to consider annually the curriculum for the Degree and such other matters, including the admission and progress of students, as may be remitted to it by the Senate and to report to the Senate thereon. It shall be competent for the Academic Council to make recommendations to the Senate, with regard to the appointment of Examiners for the Degree. 6. 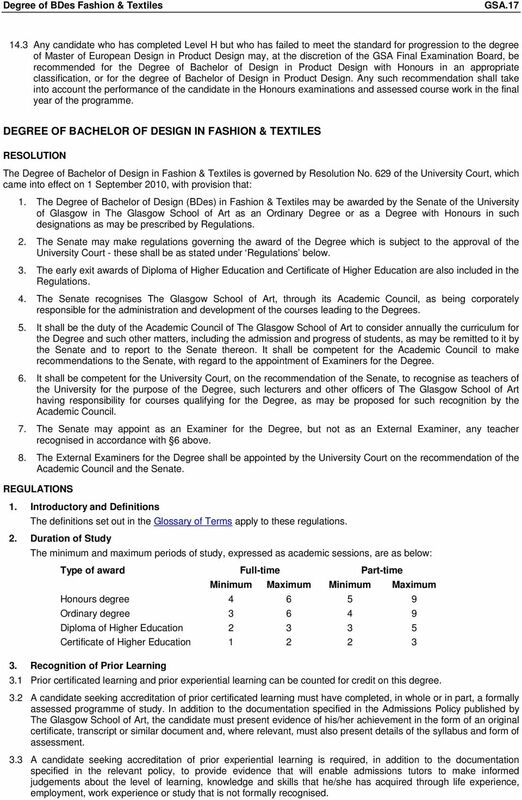 It shall be competent for the University Court, on the recommendation of the Senate, to recognise as teachers of the University for the purpose of the Degree, such lecturers and other officers of The Glasgow School of Art having responsibility for courses qualifying for the Degree, as may be proposed for such recognition by the Academic Council. 7. The Senate may appoint as an Examiner for the Degree, but not as an External Examiner, any teacher recognised in accordance with 6 above. 6 Grade point average is determined with reference to the schedule of grades and grade points contained in Schedule A of the GSA s Code of Assessment. The grade point average is calculated by taking the product of each course s weight and the candidate s grade points and dividing the sum of these products by the sum of the courses weights. The weights shall correspond to the courses credit ratings unless specified otherwise in the relevant programme documentation. Grade point average is expressed to one decimal place ( 4.4(a) of the Code of Assessment). In determining whether a candidate has achieved a required grade point average, no further rounding is permitted. Thus, a candidate achieving a grade point average of 8.9 would not satisfy a requirement for a grade point average of 9.